We’ve all heard stories about tough coaches, but there aren’t many athletes who’ve plied their trade for a dictatorial coach who developed his style while working for the KGB. You’ll meet just such an athlete in Red Army, a documentary in which the chill of the cold war reflects glaringly off hockey ice. 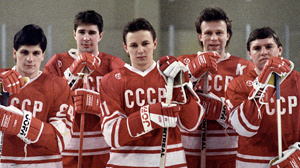 Director Gabe Polsky builds his documentary around Slava Fetisov, the gifted Soviet defenseman who played much of his career for Viktor Tikhonov, a former KGB agent who became head of the USSR’s national hockey team during its heyday. Is this the best team ever to play hockey? A stern taskmaster, Tikhonov alienated many who played for him. But aside from one stunning Olympic loss to the US in 1980, the Soviet team maintained extraordinary levels of excellence. A patriot who ultimately was treated poorly by his country and by Tikhonov, Fetisov was introduced to the Red Army team under the tutelage of a kinder, more cerebral coach, the legendary Anatoli Tarasov. A portly man who looked more like a happy grandpa than a brilliant hockey coach, Tarasov was credited with developing the team-oriented style of Soviet play that the Kremlin used as a basis for global propaganda. A highly skilled and generally unselfish team became a symbol for the success of Soviet collectivism. Unfortunately, Tarasov eventually offended upper echelon Soviet leadership and lost his job. Polsky’s interviews with Fetisov quickly establish the defenseman as an imposing figure, someone who doesn’t take kindly to anything he deems as BS. Fetisov immediately asserts his control over Polsky, who’s smart enough not to argue about it. Fetisov’s story — from his youth to his triumphant days with the Detroit Red Wings — gives the documentary an interesting arc, exposing us to the hardships faced by Soviet players who were also in the military and who were forced to live spartan lives. Tikhonov once barred one of his players from taking time off to visit his dying father. Fetisov tells us that he respected Tikhonov as a coach, but not as a man. Even those who are familiar with the story of Soviet hockey will find plenty to chew over because Polsky understands that this is a case in which athletics and politics are inextricably (and often unfortunately) linked. Polsky also details how difficult it was for Russian players to play in the West, even after glasnost and the resignation of Mikhail Gorbachev. Once the Soviet empire dissolved, players were allowed to leave, but had to share their NHL salaries with the Russian authorities. Fetisov refused to participate in any such arrangement, and suffered for it. He held his ground and insisted that if he were going to leave Russia, it would be on his own terms. Eventually, he prevailed. Red Army tells a fascinating sports story, introduces us to more than one Soviet sports icon and stands as a fascinating look at what happens when the stakes of a hockey game involve a good deal more than winning or losing on the ice.